Michael started his goalkeeping career at the age of 11 and has been involved with goalkeeping ever since. At Junior level michael played for clubs like Freebooter A.F.C, Dungarvan Utd and St Saviours where he also won honours. Michael also represented Kilkenny District League in the Oscar Traynor. Michael made is Junior debut at the age of 16 for Dungarvan Utd 1st Team. In the local Cup (Ardagh Cup ) Semi final he was scouted by a deaf representive and was asked to play for the Munster Deaf Football team. 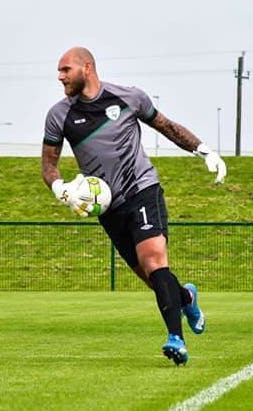 Ever since then michael has being involved with Deaf football by becoming Irelands No.1 goalkeeper and representing deaf clubs such as St.Vincents, Belfast Utd, Derby, and most recently Doncastor Rovers who recently reached the European Deaf Champions League final in their debut season which resulted in Michael receiving the honour of European Deaf Champions league goalkeeper of the year.